Growing up you don’t realize how functional or dysfunctional your home life is, but when you realize later in life your childhood wasn’t always like someone else’s you have to come to terms with it. While the story off all of that is a lot longer than I have time today, there was always something I could count on. Love. You read that right, I was one of the lucky ones that would always know that love was and had an endless supply of it from several family members. While not everyone is lucky enough to have that, I had several family members that showed what love is by their actions. Growing up I knew my grandparents were in “love” just by the way they looked at each other, and no matter what they were doing. And you know what, I never once seen them fight, so either they never fought or it was always out of my line of sight. Nana and Papa have both been gone for several years, but each day I try to remember that showing my loved ones that they are loved. Showing your love isn’t always about the material things in life, but how you talk to your family and friends as well as how you treat them daily. See that love?? That’s true love and everyone around them way just as happy and in LOVE! Did you know that February is commonly known as the month of love? We celebrate the life of Saint Valentine who is the patron of love, young people and happy marriage. While we are Empty Nesters we still take the time to celebrate Valentine’s Day with our daughter, but this year it will have to be a little different. We usually spend the evening in and have surf n turf prepared at home to celebrate Valentine’s Day. Want some new ideas to help you celebrate St. Valentine’s at home? 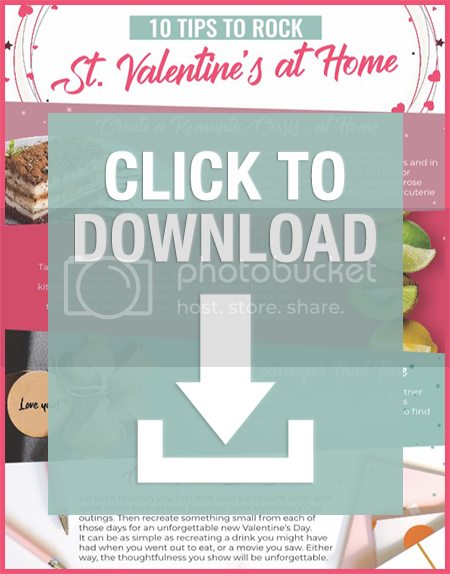 10 Tips to Rock St. Valentine’s at home contains simple things you can do at home to show appreciation to the one you love without having to spend every penny in your savings account! It also includes some cool facts about the “whys” and history behind some of the most time-honored Saint Valentine’s Day traditions! This year our daughter and her family are living in Cheyenne, Wyoming and we are sending a fun gift their way. Baby “Tater” as we call him on the blog is getting a fun Valentine’s Day Themed book, and Liz is receiving a Princess Rose Dome that includes a Red Rose LED Glass Dome elegant table lamp, a gold-tone “Love” bangle bracelet and a wooden perfume card. While Austin is getting a gift certificate for their “night in” from a local restaurant called Sanford’s Grub & Pub. I believe it will be the perfect Valentine’s Day Present and one they will enjoy for years to come. While they show each other just how much the Love one another and of course little Tater too! Want to learn more about Catholic Central? Visit their website and their YouTube Page! But before you go be sure to check out the #CatholicCentral & #SaintValentinesDay Giveaway below. Enter for your chance to win this giveaway for the Saint Valentine’s Day Kit! Disclosure: The opinions expressed are my own and may differ from yours. Life with Heidi is not responsible for prize shipment For questions concerning this giveaway or to host your own giveaway please contact heidi@lifewithheidi.com. Disclosure: We reserve the right to make revisions, to cancel, or suspend this contest for any reason. We are not associated with any of the companies named above. The odds of winning are based on the number of entries received Open to the US 18+ only. Confirmed Winner(s) (by Random.org) will be contacted by email. Winner(s) have 24 hours to respond before a new winner is chosen. No purchase necessary. Void where prohibited by law. The sponsor(s) will be responsible for product shipment to winner(s) of this giveaway. Life with Heidi (and any other blog participating) is not responsible for product shipment/delivery. This event is in no way administered, sponsored, or endorsed by, or associated with, Facebook and/or Twitter, Google, Pinterest. This disclosure is done in accordance with the Federal Trade Commission 10 CFR, Part 255 Guides Concerning the Use of Endorsements. Entrants must only enter with either one email address, IP address and/or Facebook account, anyone found violating these rules will be disqualified. It is at the sole discretion of the admin of the giveaway if the winner has met the rules or not. Previous Post: « How Much Does It Cost To Reinstate Your License In CA? Having a party with my 4 granddaughters to celebrate Valentine’s Day. My favorite Valentine’s Day memory is when my now husband proposed to me. My favorite Valentine’s day memory is when I was growing up. On Valentine’s day my mom would slide a card under my door before I got up with money in it but the card is what I will always remember. I used to like spending it with my family growing up. My favorite memory is when my husband gave me a ring for Valentines Day. My husband making me dinner and relaxing at home with our daughter and our puggy. My favorite is when I went to a dance with my friend and her husband during the time I was dating her brother-in-law. It was a fun night and the only time I went out on Valentine’s Day. I hate to be the bummer of parties but I don’t think I have ever had a good Valentines Day. sorry. I dont really have a favorite memory. I would love an enchanted rose though!